Darcy Merriweather is Enchanted Village's newest resident Wishcrafter—a witch who can grant wishes for others. 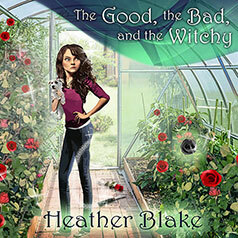 But as Darcy prepares a celebration for a magical florist, she discovers that every rose has its thorns. When magical florist Harriette Harkette decides to throw a lavish eightieth birthday party for herself, she hires Darcy's Aunt Ve's personal concierge service, As You Wish, to plan the soiree. But turning eighty isn't all Harriette is celebrating—the Floracrafter has recently created the midnight black Witching Hour rose, the first all-natural rose of that color. Darcy works hard on planning an extravagant celebration that will make Harriette feel like the belle of the ball. But when cake delivery boy Michael Healey—a former employee at Harriette's greenhouse—is found dead, the celebration takes a turn. Now Michael's ghost has imprinted on Darcy, meaning that they're bonded until she can untangle the thicket surrounding his murder—and what exactly it has to do with the Witching Hour rose.